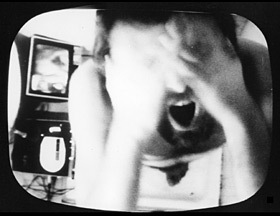 Video Immunity, 1978, b/w, 4 min. The video was recorded with camera attached in place of the water-spray in a shower. The artist gets into the tub under the camera and undergoes the ritual of �?votive ablution�? exposing his body to the camera as if he were under the shower. Otherwise than the shower which cleans the body by means of a stream of water, the videocamera transforms the body into a television picture consisting of a stream of electrons. According to the Bible, ritual ablutions give a man his name, whereas, according to the Indian creed, taking a photograph bereaves him of his soul.